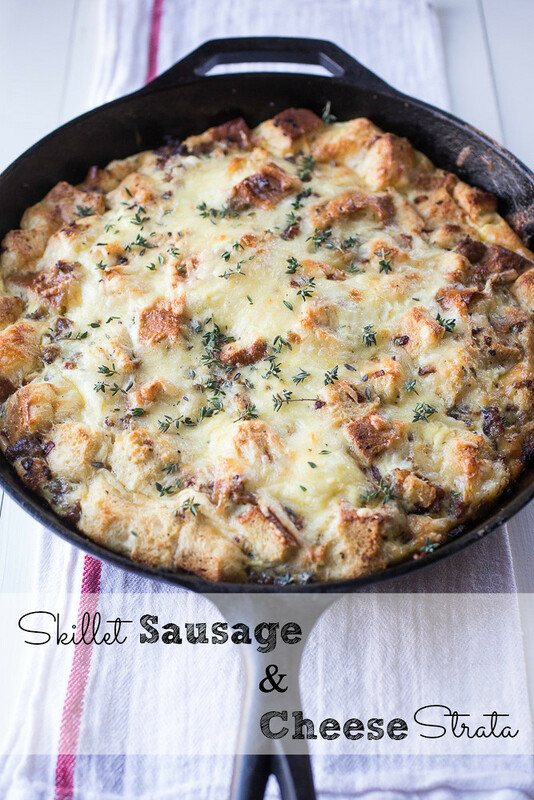 Skillet Sausage and Cheese Strata: A crazy delicious breakfast casserole with simple pantry ingredients that doesn’t need an overnight in the fridge! Now that Christmas is firmly behind us, let’s look towards New Year’s, shall we? New Year’s certainly doesn’t evoke the level of stress that hosting Christmas dinner does for me, although don’t get me wrong here. Three gin and tonics throughout the afternoon followed by beef tenderloin and broiled lobster tails for Christmas dinner definitely reduced my stress level. Ha! But New Year’s is sort of a laid back holiday, isn’t it? A time for gathering, visiting, more eating and more drinking. Our NYE is way low key these days, nothing like the Eves of my early 20s I used to spend drinking with my friends and sleeping wherever there was room. Kyle is usually in bed early since he works all day, and often before the ball drops. My life is that of a university employee who always has the week between Christmas Eve and New Year’s Day off. So my tradition is watching Bridget Jones’ Diary every NYE, by myself with a bowl of popcorn. It’s lovely, really. Last NYE, I made a batch of dulce de leche overnight cinnamon rolls for breakfast on the 1st. And they were freaking AWESOME. Just check out that drizzle! 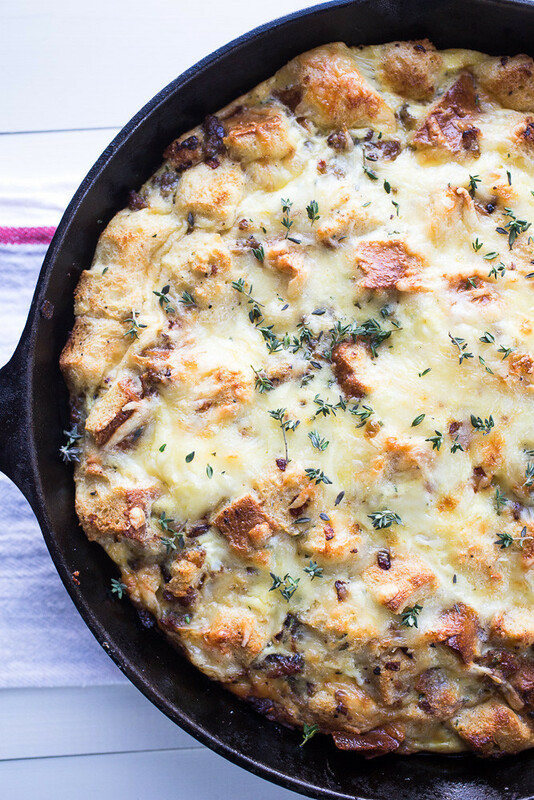 This week, I’m considering either biscuits and gravy (with a new biscuit recipe) or this skillet sausage and cheese strata. I made this skillet sausage and cheese strata the day after Christmas last week for my parents and brother. (Kyle was again, working). And it was a perfectly simple and delicious breakfast casserole to whip up after waking up wondering how I going to function that morning both from “hosting fatigue” and a foggy head because let’s face it, I had wine with dinner too. I didn’t need to buy anything special for this breakfast casserole. Instead, I pulled everything from the fridge – leftover cheese and bread, the last of the milk mixed with heavy cream, an onion, thyme, eggs, and that ground breakfast sausage I bought on sale 2 for 1 a few weeks back. Easy peasy! And no major thinking required: the perfect breakfast to start the new year, indeed. No need to think too far in advance to make this recipe! It cooks in about 30 minutes so breakfast after a busy holiday or late night is not too far off. Preheat oven to 425° F. Melt butter in a 12-inch heavy-bottomed skillet (like cast iron), and cook the sausage over medium-high heat, about 2-3 minutes, crumbling it with a wooden spoon as it cooks. Add the onion and ½ teaspoon salt and cook until the onion has softened, about 5-6 minutes. Meanwhile, whisk the eggs, milk, thyme, 1 cup of cheese, and ¼ teaspoon pepper in a large bowl until well-combined; set aside. Toss the bread cubes into the pan and stir them into the sausage-onion mixture, cooking for about 3 minutes until they start to lightly toast. Turn off the heat and remove the pan from the stove. 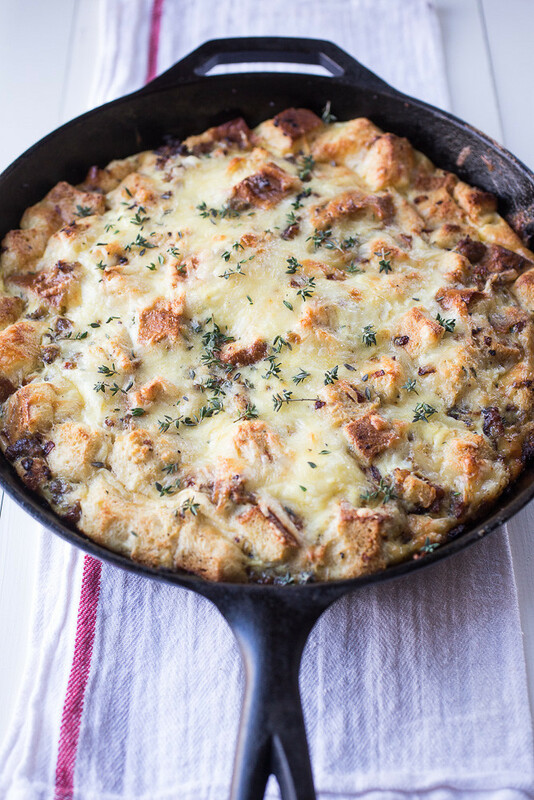 Pour the egg mixture into the pan and fold the eggs into the sausage, onions, and bread. Gently press the bread into the egg to help it absorb the egg. Sprinkle the remaining ¼ cup cheese over the top. Transfer the skillet to the preheated oven and bake for 12 minutes, until the top is puffy and golden brown in places, and the sides of the strata have slightly pulled away from the sides of the pan.